1. Choose a reliable and reputable company, preferably local. A local company is close enough geographically to tend to your needs and is likely to understand your context and deal with any issues quickly. They also have more at stake themselves, as their reputation within their local business community is dependent on the quality of their product and service. 2. Quality is always better then quantity. You may like the idea of giving a hamper that is so full of cellophane, ribbon and packaging that it looks enormous, but you are really only setting the recipient up for disappointment. Better to give quality gourmet fare that will be a treat to receive and eat, even if there is less of it. - e.g. Christmas cake, gourmet condiments to accompany the Christmas 'feast' such as cranberry sauce, mustards, chutneys, salad dressings, nuts, chocolates, candy. 4. 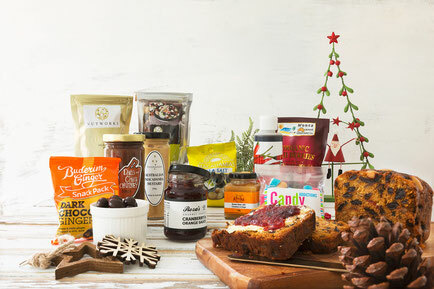 If the hamper is to be shared by an office, a tasty collection of good quality nibbles such as nuts, chocolates, fudge, crispbreads, fruit paste, etc will be very appreciated. Good quality wine to accompany the hamper is always appreciated, with Sparkling being the most popular choice during the festive season. 5. If possible, try to buy regional food. With the number of ‘foodies’ in our midst forever on the rise, gourmet food from local artisans that typifies its region of origin will stand out from the crowd.